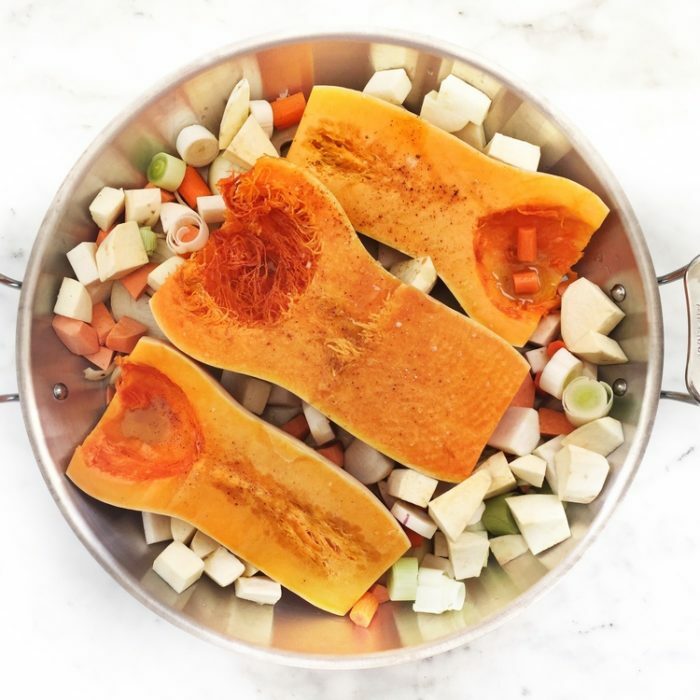 Place the butternut squash, face up in a baking dish. Place all the chopped veggies around them, drizzle with the olive oil and sprinkle all the spices on top. Add 2 cups of stocks, cover and bake for 1 1/2 to 2 hours. Let it cool to be able to handle to veggies without burning yourself. Remove the flesh from the squash in a large pot, discard the peels. Add all the cooked veggies and the rest of the stock, let it simmer for 5 more minutes. Pour everything in the food processor and carefully blend everything. I always use my vitamix for soups, I feel that it makes the perfect creamy texture without actually adding cream to it. I served it with homemade croutons for the kids, crispy quinoa and pumpkin seeds for my husband and me.